Havana – Burlingame Historical Preservation Society, Inc. In 1858, a town called Havana was laid out, about four miles west of Burlingame. For a time it looked as if it would become the great town of the neighborhood. The City Company was made up of wealthy Germans of Chicago and St. Louis. About fifty German and French families located in the vicinity, large farms were opened, and in the town a store with a large stock of goods was opened, the machinery for a large mill was brought on, about half-a-dozen dwellings, and a large stone hotel erected, whose doors and windows were made of native walnut. 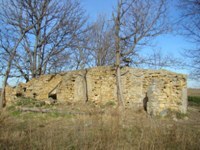 A large stone distillery and brewery was commenced. But its prosperity soon came to an end. The leading merchant failed, the members of the company quarreled, the settlers soon became dissatisfied with a country life, and it was not long until all left never to return, and the town became extinct. Many of the Germans moved to Alma and the property was sold for taxes. The hotel was used many years as a barn, and the distillery later became Davis’ grist-mill. Today the hotel and store are gone, and only the remains of the stage station are discernible. Ruts from the Santa Fe Trail are still visible today to the west of what was Havana Stage Coach Station. The land is privately owned. Across the highway is the grave of a dragoon soldier of the United States Army, Samuel Hunt, who died in 1835 while doing service along the trail. Soldier and Dragoon creeks were named for him.